A story can have a lot of different structure. Storytelling is not made of one way but there is always a few lines you can follow when you don’t know what you are doing. This article is not made to claim that a unique structure exist, but to gives a path for beginners to build a trailer that won’t harm your game. Story is the narration of connected events designed to make the viewer feel. Stories are not necessarily built from words and characters. Games are a very different media than what we are used to (movies, painting, photography, litterature, music…). It happens regularly that a game has no story, no lore. You might think a story can’t exist if there is no character, and it is partly true. However, in a trailer, the story appears in various shapes. Take “Tetris” for example, the trailer could begin with the early game with a few blocks in the bottom and finish with the blocks reaching the top. Structure is organizing your assets in a specific chronological order. Why is structuring important? Currently, we can all agree a trailer is a powerful marketing tool. However, it is double-edged; a bad trailer or confusing one won’t help you engage the viewer and make it visit your website. Good Trailers are not created by accident. A phase of pre-production is required to scope down what you will show and how you will do it. You can manage to do that during the editing process, however, taking the time to think ahead prevents you to fail and have a clear picture of the whole. Before opening the game and start capturing footages, sit and think deeply about your game. This is a diagnostic phase and it is crucial. Good questions allow good answers. Also, two similar questions asked differently will give two different answers. What do people should remember from the trailer ? What emotions do you want to bring to the viewer ? If you wanted to show only 1 thing, what would it be ? What do you want the viewer to know ? to understand ? How can you simply explain your game ? What is entertaining in your game ? What reactions/emotions do players have when they play your game ? What would be the elevator pitch of your game ? What is not important to show ? … How many questions do I have to answer Edwin ?! A lot. It might be very likely to want to show specifics mechanics/info of the game that would not benefit the trailer itself. It is hard to throw away something you think is part of the game but sometimes it doesn’t add anything valuable Keep in mind that the trailer is not the experience, just a brief glimpse of it. Also, keep objectivity in your back pocket. You know your game on the tip of your fingers but it isn’t rocket science for the rest of the world. In every step of the process, imagine being a newcomer. This is the main reason why you don’t explain EVERYTHING in a trailer, keep it simple and straight to the crucial information. Focus in a specific aspect of your game. We are not robots, yet, our brain don’t remember everything we watch in a trailer, but only a few bits of information that strike us at the moment. The word Structure can be intimidating but you just have to understand what Aristotle said in Poetics: a story has a beginning (Protasis), a middle (Epitasis) and an end (Catastrophe). You can also think of Thesis, Anthithesis, and Synthesis from Hegel. 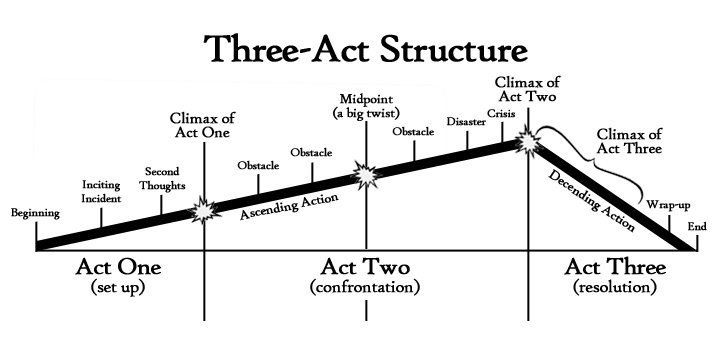 Here we will speak a bit more about the Three Act Structure in trailers and why it is a great way to make sure your trailer has sense as a whole. In the storytelling world this “magic structure” is being targeted a lot but you can’t deny his efficiency. I think in trailers this is a great and valuable easy-to-go when you aren’t sure about what you are doing. What this structure does is that it ensures you to have a continuous build up and reach a climax. To have a fork of length, usually the Beginning is 25% runtime, Middle is 50% and the End is 25% runtime. You can make it 10-80-10 or 50-40-10 if you decide to. You just have to clearly define what are the big steps in your trailer and which importance you’ll grant them. Also, 3 segments is not mandatory, your game trailer can suit 2 or 5 parts. As you can see in the image below, the Act Two is even composed of 2 sub-parts. Showing what your game is about should be a safe bet. The most intense point is relative to what is present in the trailer. If your game is about walking, someone running among the crowd would be impressive! A character-based story is the most universal structure: Something happens to your Protagonist. Therefore he goes on an adventure and things happen on his path. Therefore the protagonist reaches a point of no-return and something has changed deeply (discovery, win/loose…).This is what Joseph Campbell calls the monomyth in his book The Hero with a Thousand Faces. Mario is a plumber, he has been given a quest to save a princess, therefore he goes on an adventure and encounter creatures, therefore he ends up saving Peach. Neo is a simple man, he is living in the Matrix and chooses the red pill, therefore he goes on an adventure with Morpheus and his team, therefore he ends up fighting agent Smith to find absolute truth. Frodo is a hobbit, has been given a quest to destroy a ring, therefore he goes on an adventure with his new company, he ends up accomplishing his quest. Harry Potter is a young boy and discovers he is a wizard, therefore he goes to Hogwarts and goes on an adventure with his new friends, therefore he kills Quirrell and discovers new truths. If your game is character-based and story driven, there is a good chance that you fit in this. In that case, you can try boiling down your story to the core (1-3 sentences). This could become the main structure of the trailer blended with gameplays footages. Obviously, not every game trailers use this kind of story (monomyth) as the main catalyzer to engage the viewer, however, every good trailer has a structure. Now, you might think “Great, my trailer will be like everyone else! Thanks Edwin!”. but it is not the structure that makes a trailer stand out from the noise, it is the content in it, the way a story is told. Without clear structure, you won’t have a story. And if you don’t have a story, what do you have to say ?